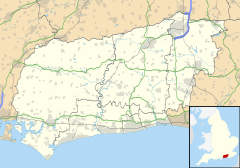 Chichester (/ˈtʃɪtʃᵻstər/; is a cathedral ceety in Wast Sussex, in Sooth-East Ingland. The Ceety o Chichester is twinned wi Chartres, Fraunce an Ravenna, Italy. This page wis last eeditit on 19 Juin 2017, at 23:08.